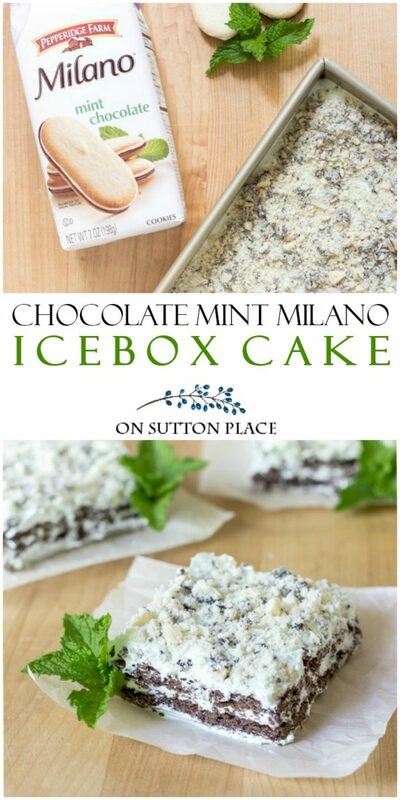 This Chocolate Mint Milano Icebox Cake has just 5 ingredients and is no bake! Whip it up in no time for an easy, fresh dessert. Perfect for St. Patrick’s Day! 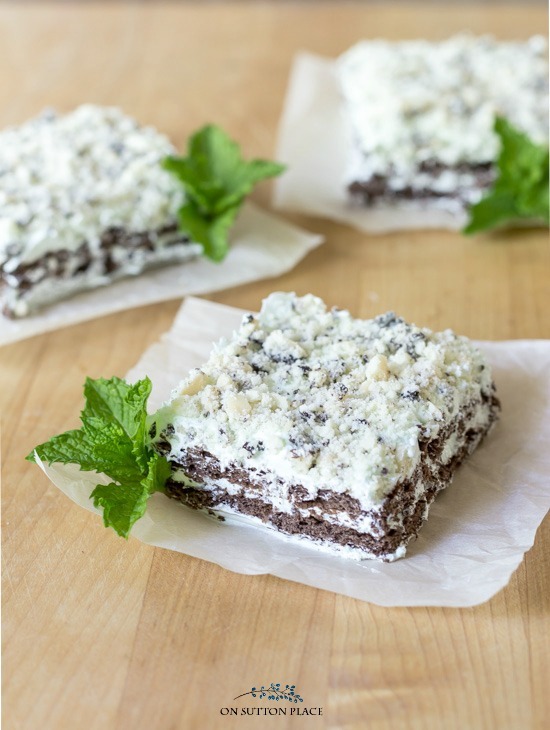 Easy, no-bake desserts are perfect any time of the year, but this one is particulary appropriate for St. Patrick’s Day. I’m sharing this Chocolate Mint Milano Icebox Cake that is as refreshing as it is pretty. 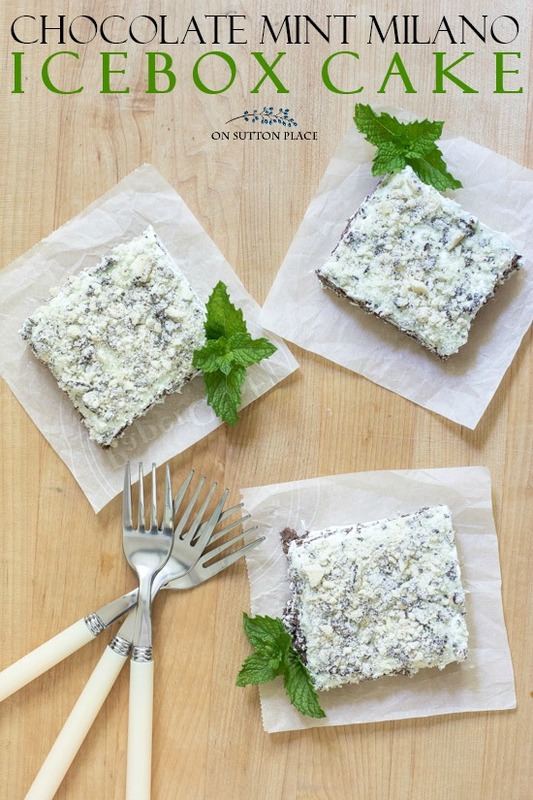 I still think my Lemonade Icebox Cake might be the prettiest, but this mint and chocolate version is a very close second. It goes together in layers just like my other icebox cakes. I tried a 9 x 9 square pan this time to see if the edges of the cake would come out better and they do. All the pieces came out great. Keep in mind though that you will probably get one less layer. This time around I had 2 layers of graham crackers and 3 layers of Cool Whip. An 8 x 8 pan makes a fuller cake for sure. 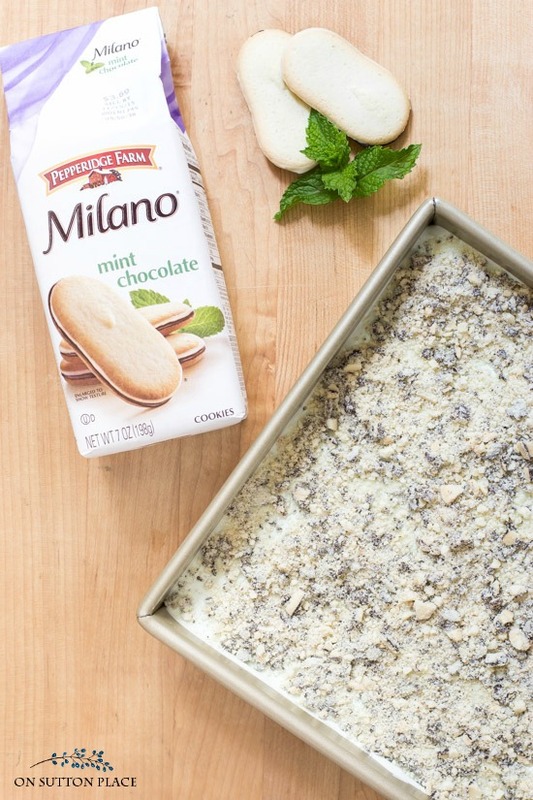 This Chocolate Mint Milano Icebox Cake has just 5 ingredients and is no bake! Whip it up in no time for an easy, fresh dessert. Perfect for St. Patrick's Day! Empty the container of Cool Whip into a large bowl. Add peppermint extract and stir well. Add drops of food coloring until mixture is your desired color of green. In an 8 x 8 or 9 x 9 pan, spoon a bit of the Cool Whip mixture to make a thin layer. Top with a layer of chocolate graham crackers. Repeat layers until all your Cool Whip is gone. Make sure to end with the Cool Whip on top. In a large ziploc bag, place 10 Mint Milano cookies. Crush with a rolling pin. Cover and refrigerate at least 6 hours. Overnight is best. Cut and serve with a fresh mint garnish. These cakes are not an exact science. Sometimes, if I’m heavy-handed with the Cool Whip, I can get more layers but in the end it never matters. Once the magic happens in the refrigerator, they all taste amazing. Couple of things. I used my Kitchenaid to mix the extract and food coloring into the Cool Whip. It would be fine to just use a wooden spoon. Throwing the cookies into a food processor would work just as well as the bag and rolling pin method. I figured it was one less thing to wash if I didn’t use the food processor! Click [HERE ]for my collection of Icebox Cakes. Click [HERE] for my favorite 9 x 9 baking pan. Want new blog posts delivered straight to your email inbox? I am delighted by your holiday ideas for March! You always give me something new and fun to add to my décor as well as my recipes.. Thank you for all the work that I know goes into your blog, and thanks for sharing! I love those cookies! Looks yummy, Ann:) A must try for sure! Love the recipes and your presentations. I’m thinking these would be great in Mason jars. I’m not familiar with the chocolate graham crackers. If I would use the chocolate wafer cookies would I use just one package….not sure of sizes here. This looks yummy! Bet it would be good using orange Milano cookies, with orange extract and food coloring too! When I was a kid, my brother’s favorite dessert was an icebox cake made with vanilla and chocolate pudding, bananas and graham crackers. Nothing better anytime, but expecially on a hot day. The brightest star in the sky is Sirius, also known as the Dog Star. Sirius was given this name by the ancients because it was considered the hound of the hunter Orion, whose constellation was nearby. The Dog Star was regarded by the ancient Greeks as the bringer of scorching heat, because its early-morning rising coincided with the hottest summer days of July and August. The Greek writer Plutarch called this time hēmerai kynades, literally, “dog days”—the days of the Dog Star—and by way of Latin this phrase was translated into English as dog days. Sounds like a great recipe! The “dog days” comes from the star or stars in the Sirius constellation being brightest at this time of year. It just happens that it is always hot.